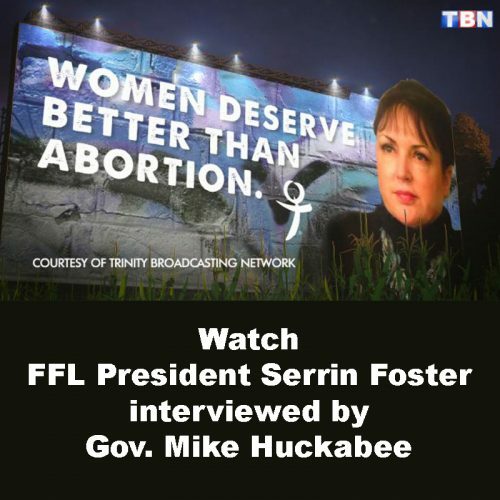 FFL President Serrin Foster talks pro-life feminism at the invitation of conservative host Gov. Mike Huckabee. Hear Gov. Mike Huckabee’s opening monologue powerfully defend children with Down syndrome after a Washington Post editor said if she conceived a child with Down syndrome she would have had an abortion before he introduces FFL President Serrin Foster as the first guest of the night. Serrin talks on Gov. 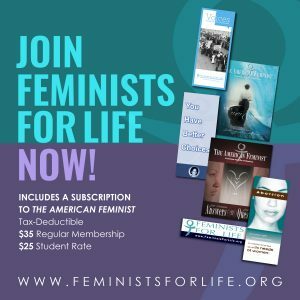 Huckabee’s show about pro-life feminist history during Women’s History Month and the need for resources and support on campus and in the workplace and paternal support, and has a special message for women who have had an abortion. (Did Serrin convince Gov. Huckabee to become a feminist??) And Gov. Huckabee suggests you bring Serrin to your next event and FFL to your campus! Check out the full show, which includes music by Lorrie Morgan in the next segment — who met Serrin backstage and said she loved what we do and wants to be a part of us and help! To book an interview with Ms. Foster regarding Women’s History Month or other issues, or with Speaker Joyce McCauley-Benner, contact info@feministsforlife.org.